The renowned Indian artist talks to RIR about his childhood memories in Bihar and why he would like to come back to Russia with an exhibition. I see many people coming to India and having very different impressions. What is your India? This is my home and I don't see so much change come so naturally. You don't realise the change because you are all the time living there. Nothing surprises me here because yesterday I was a 10-year old kid and today I am a 50-years old man. Of course things have changed but one doesn’t realise it much. For example when metro first came, this was a change, but now it feels like the metro has been here forever. General elections are going on now. If you have a chance to become a minister and change something in the world of art, what would you change? There is a lot to do in this country. First of all, the government academic art… The way it is running, the way they fund it, everything here is commanded by the government and they have no clue how to handle the situation. Even the Lalit Kala Academy and National Gallery of Modern Art are run like government offices. So there is a need to do a lot. Apart from that, new museums need to come, new architects need to come. Since the 1960s, after Nehru, we do not have many changes, no new architecture came in all over the country. So we do not have opera houses, we do not have new theatres, we do not have new galleries, we do not have new museums. Yes if I have to do, I will do lot. How do you see the role of art in people`s lives? It has a huge role. Art can change. Art is the first language of the universe. A good thing for art is that you don`t need to know Russian or Hindi. Art has only one language. It is the universal language. This is one of the most powerful languages. When people were not able to speak, that time man started speaking through art and the cave painting was the biggest example of that. Yes, art can change. It already changed human beings, human perception, human living and is going to change more. Yes, art is more powerful than anybody can imagine. You brought to the people through the art much from your childhood memories in Bihar. What do you think would be your memories from nowadays? Food. This is my modern memory. I paint food. I eat everyday and it is like a diary. I am like writing, look this flip case. We live in India, so I also work with social issues and everyday mundane objects. The banyan tree is very significant work. It is very new work, expressing the life about today too. Could you recall you childhood in Bihar again. What did your mom love cooking? My mother, she cooks very local food, very traditional food but cooking food is itself a great art. So cooking normal things like, rice, vegetable but the way it is prepared is very very important. Taste can change completely. My mom is a foodie too, very precise about the food. If you have a chance to organise an exhibition in India where you can take five artists` works from all around the world what would be your choice? First of all, there should be Francisco Goya. I like Goya very much. I like Hieronymus Bosch. Then of course I will take Michelangelo, no doubt about it and then Van Gogh and then I will take Mark Rothko, an American painter of Russian Jewish descent. You were a part of Moscow Biennale if I am not wrong. How did you find Russia? I love Russia. First time I went there, I had a little problem but it is all over the world, when somebody is trying to cheat you. But it was fine and because I had come from India so had been experienced. I am Indian, please don't cheat me. Second time I came to Russia in 2010 to design the stage set for the ballet CREATION 2010 by Angelin Preljocaj, the French choreographer in the Bolshoi Theatre in Moscow. I went there two or three times and Russia is a completely changed world today. Great food, great wine, great people, good-looking people, walking and historical buildings. Lots going on in Russia right now. 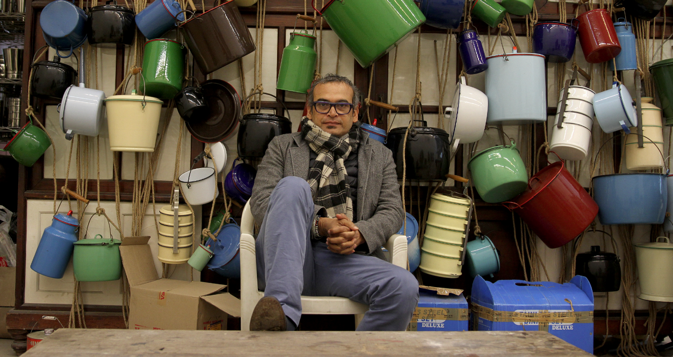 Could you divide your art into different periods or is there only one Subodh Gupta? I do not know. If people want to divide, they can divide, I have no problem with that but yes, I am Subodh Gupta and I will keep doing what comes to me, what comes to my mind. Life is too short to divide. Better I just keep doing and forget what I have done. So I am always looking at future, I am not looking back anymore. Many of your works had been done from bronze, Why? The bronze is a good thing. I never realised that until I met the curator Germano Celant and he wrote very nicely in his book about how India had a tradition about bronze, Chola bronze, the 500-600-1000 years old God and Goddess picture made in bronze. Casting bronze India has a tradition but same material the way I am casting it is like carrying on my own tradition but very different way. So I never knew about this but I have made this subconsciously. When will your next exhibitions be held abroad? Two-three group shows are coming up. Then I have a show in Frankfurt in the fall, at the MMK Museum. Second week of September. That is going to be quite again not huge like here but still it will be a good show, very comprehensive. I am working for 2015- 2016 and we are already planning it. A lot of things are happening. I have a solo show in Seoul and Shanghai this year as well. You grew up in the village. How do you think the globalisation will change the face of Indian villages in future? Oh well, something will stay. Still farming and agriculture are very important in India. There are very poor people too and whichever government comes, they have to help them to come out from their poverty and the education and that is the most important thing but as long as they are farmers or they are living their same livelihood even they are little established in their life, the culture is not going to go. I find Delhi like a village too because still you find in Delhi same thing what is happening in the village too. You broke the $500,000 mark at Christie’s and Sotheby’s and then crossed the $1 million mark. What did you have to say about that? I work as an artist. I work with my gallery. What happens out of the gallery, my studio and especially in the auction house, I try not to look at that so much. I like to avoid that part. I like to focus and put my energy in my art because that market has many ups and downs and sometimes it is a manmade market. It is very difficult, that is why artist works with one of the good established galleries which are not talking about the market, but about the artwork. They allow me to focus on my creativity and that is the most important thing. But for many people your way of living is a dream. What is your dream? Will Jack Nicholson or Robert De Niro not act when you give them a good script? Will Rolling Stones not sing when they have so much money but also have energy? In the same way my job is to make art and whichever situation I am in I will be making art. That is my job and that is my dream. Could you recall some sources of your inspiration? Human beings. Simplicity. Simplicity in the life, simplicity in the nature. Life around me, and no matter where I live I know where I am coming from- it has a huge impact on my life. I have seen many things in my life in such a small time. Still I go and buy my vegetables. I interact, be as myself and I interact with the people, I interact with the young artists, I like to hear them, I like to talk to them, I like to be there. So that is very important and as long as I am doing that, so my inspiration comes from you, my inspiration comes from the people, my inspiration comes from the road, basically very simple life. And if you have a chance to make some of your solo exhibitions in Russia, would you do this? Yes. I just need an invitation from the Garage Center for Contemporary Culture in Moscow (laughing). Nobody invites me to talk in India. That is a tragedy and I do not know why it's like this. For a month I was teaching in Paris. I will love to talk to the students and maybe students have so much things to ask me. I do not know but I would like to interact with them. I liked one of your work very much - casted ambassador car. What does it mean for you? I love the ambassador car. I do not drive one. But I like its design. It is so iconic car in this country especially when all the politicians use it with a red light beacon. If you look at the Indian cow on the road and the Indian ambassador car, they don't have any differences. Both of them are very iconic Indian roadside image just in front of your face. So that is why I thought that since I cast that cow, why not I cast the ambassador.